Calling all fine cheese and wine lovers! Kick off spring with Ledger David at Le Petit Tasting Room in Central Point as we celebrate the 12th Annual Oregon Cheese Festival. It’s always a busy, fun time during this annual event, held this year at the Rogue Creamery, Saturday, March 19 from 10am-5pm. To complete their culinary experience, event attendees make it a tradition to stop at the Artisan Corridor’s neighboring wine and chocolate shops. That’s where we co me in! We’ll be open from noon-5pm to greet you with a selection of your favorite wines paired with warm tomato bisque, clam chowder, and fresh baked bread. Listen to the eclectic sounds of Savanna – performing a blend of early rock, country and blues from 1-3pm. If you’re heading over to the big tent at the Creamery, stop in and see the Ledger David team! For a more intimate experience, check out the Cheese Makers Dinner the night prior to the festival, on Friday, March 18. Tickets are $125.00 and include a sumptuous 5-course, cheese-themed meal. Each course is crafted by Chef Damon of Inn at the Commons and will spotlight a cheese made by one of the festival’s artisans, paired with a local wine or beer. 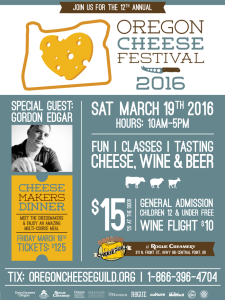 All event proceeds benefit the Oregon Cheese Guild. Southern Oregon (actually Central Point) is the birthplace of the Oregon Cheese Guild, which was founded in 2006. Rogue Creamery was the site of the first Oregon Cheese Guild Benefit Dinner and the first Oregon Cheese Festival. This year’s event will also feature a petting zoo and a photo booth. For more info, visit www.oregoncheeseguild.org. Join Ledger David Cellars for our spring Primoris Wine Club pick up party March 4-6 at Le Petit Tasting Room. Celebrate the release of Ledger David’s newest wines including our 2013 Cabernet Franc – recently named a ‘Cellar Selects’ by Oregon Wine Press. Wines also include the lively 2015 Primoris Chenin Blanc and popular, full-bodied 2013 Tempranillo. Enjoy these wines with a selection of French-inspired small bites from Café Dejeuner including watermelon salad with feta, creamy potato and leek soup, and pasta with a robust red wine sauce. We’re staying open a little late on Friday and Saturday just for wine club members! Please let us know if your billing information has changed. Call Heather Davis at (541) 664-2218 or email heather@ledgerdavid.com and she would be delighted to update your payment information before processing your wine club order. You can also now update your credit card online with our secure wine club form. We will be processing orders on Monday, February 29. As a reminder, 3-bottle members receive a 15% discount, 6-bottle members 20% and 12-bottle members 25% discount on all wine club selections. If you are unable to join us during this event weekend, your wine club selections will be available after Monday, March 7 at the tasting room in Central Point (next to the Rogue Creamery) any time during regular hours.